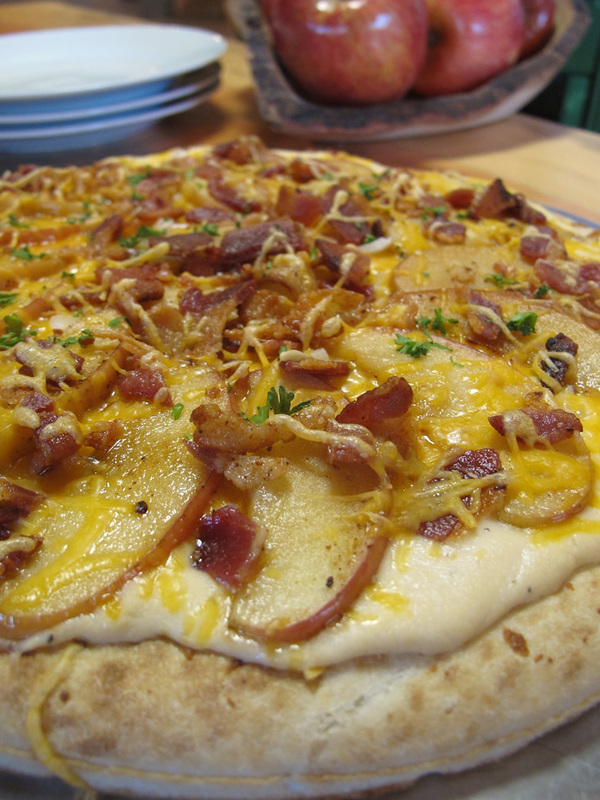 Sweet Fuji apples paired with sharp cheddar and smoky bacon makes a pizza that you will never forget! In large skillet, over medium high heat, cook the onion and apple slices in the bacon drippings until they are tender. Set aside. Place the pizza crust on a baking sheet that has been sprayed with cooking spray. Spread Alfredo sauce over the pizza crust. Sprinkle grated cheddar cheese and onions over the sauce and then arrange cooked apple slices in a single layer over the cheese. Next, add the cooked bacon crumbles over the entire pizza. Cook pizza for 20 minutes or until pizza crust is crisp. Cut pizza into slices and enjoy!